Sydney Shop Girl: Medal Winning Manis. Coooookkkkkiiiiieeeee - Part 2. Medal Winning Manis. Coooookkkkkiiiiieeeee - Part 2. Hands up if you were up at 5.30 this morning to watch the first of the swimming finals at the London Olympics? And wasn't it a proud moment for Australia when the team's first gold medal was won in the pool by Alicia Coutts, Melanie Schlanger, Brittany Elmslie and Cate Campbell? 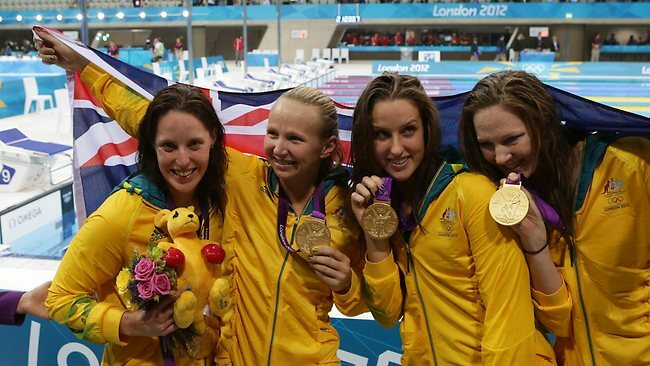 They completed the women's 4 x 100m freestyle in an Olympic Record time, beating the Netherlands and the USA. Even Michelle Obama was cheering them on in the audience. The women's swimming events are my favourite competition of the Olympics. All the medal winners seem like genuinely nice young women and their youthful excitement and energy is a joy to watch. I also like that their events are a celebration of what women can do in a swim suit rather than how they look in one. That their greyhound like physiques come from training and are built for speed and endurance rather than from the imaginations of a master photoshopper somewhere in magazine land. Though I have to admit, I was fixated on one part of the swimmers' physiques. Their fingernails. Or more specifically, their manicures. The Dutch team all had a strong orange on their nails whilst the Australians went for gold and green. It was the first thing I noticed as they dived into the pool to begin their swims. Team USA featured some patriotic nail art, from memory. As promised, I'm also back with news about what I did with the other 600g of Oreos from the other day. The good news is that it's a very simple recipe and the even better news is that it's pretty tasty too. All you need are marshmallows, butter, Oreos and the ability to work quickly with the melted combination of the three. I found the recipe for No Bake Chewy Cookies and Cream Bars here. 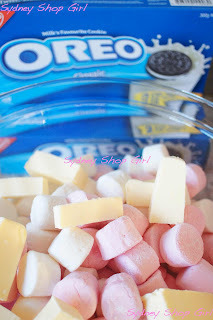 I adapted the amount of each ingredient to what I had on hand - 600g Oreos, 90g butter and 6 1/2 cups of marshmallows. The first step involves melting the marshmallows and butter together in the microwave. I used a pyrex bowl (which proved handy when it came to the washing up) and started with 1 1/2 minutes on HIGH before blitzing at 20 second intervals until the marshmallows started to melt. 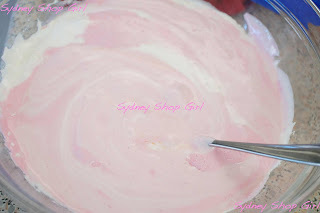 Besides looking very pretty, the melted marshmallows leave your kitchen smelling very Candyland. Then I stirred everything through and added the mixture to 600g of food processed Oreos. I got a good result by using my Kitchenaid to do the mixing but if you've got particularly good upper body strength (possibly from Olympic level swimming), you could mix by hand. Be warned though, the marshmallow stiffens up quickly, especially in this cold weather. Once you've got everything well combined, transfer to a lined square cake tin. It helps to grease over the baking paper and to also leave a lot of extra paper hanging from opposite sides for de-panning later. The original recipe calls for a 20cm square tin. With my larger sized mix, I used a 23cm square tin. To get a smooth and even top to the bars, place a sheet of baking paper over the mixture and press down evenly until you get as flat a finish as you can. I had one of those a-ha moments and realised that rolling a can of soft drink over the surface does a pretty even job. As an aside, may I tell you how much I love flat ginger ale these days? I purposely open a can the night before I want to drink it to let most of the bubbles out. 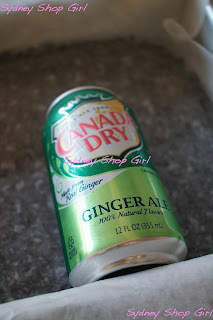 I particularly like the Canada Dry brand which (you'll be so surprised to know) is available at Costco. Also, if you're currently on icky tasting powdered supplements for whatever reason, dissolving it in a half / half mix of water and flat ginger ale definitely helps the medicine go down. I haven't tested this on cod-liver oil though. Does anyone take that stuff anymore? Back to the cookie bars. They set pretty quickly in the fridge. I left mine for 4 hours and it set to a glossy finish. The texture is smooth and chewy. 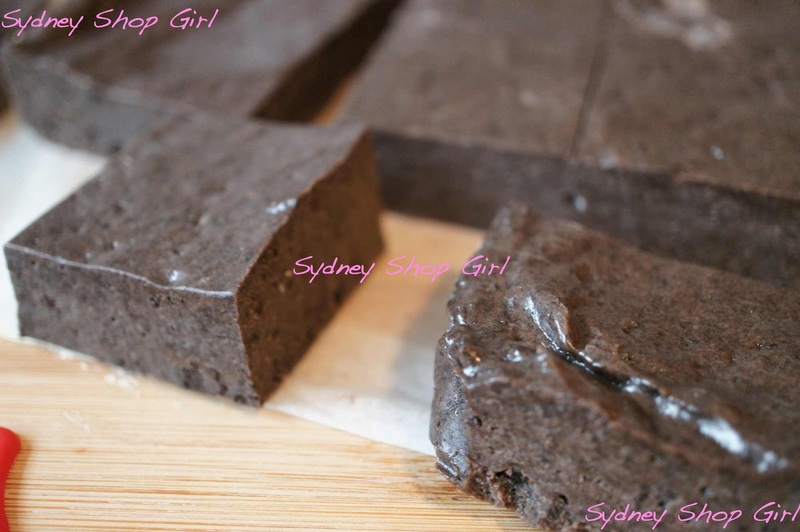 Less creamy than a fudge or truffle. There's also a bit of a crunch as well. The bars are easy to cut. Even I managed to get Donna Hay magazine worthy edges with a normal kitchen knife. As the bars are pretty rich, I ended up halving my original 3cm square slices into little fingers. 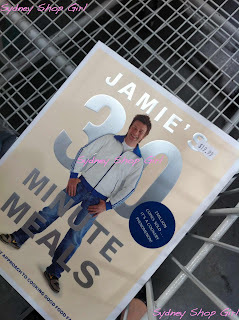 After weeks of watching the series on Lifestyle Food, I finally caved in and bought Jamie's 30 Minute Meals today. Costco is selling the hardcover version for $19.99 at the moment. I think the true test for me isn't taking 30 minutes to get the meal on the table, it's going to be whether I can clean the kitchen in less than half an hour afterward! Have you tried any of Jamie's 30 minute meals? I was up at 0330WST to watch the swimming. Am such an Olympics tragic. Jamie's 30 minute meals are not always 30 minute meals. They are delicious though and I have a few favourites - the veggie curry, the jerk chicken, and the pasta. I really want to try the giant spiral sausage! I've never managed any of the meals in that book in 30 minutes. It's all very Masterchef in the kitchen while you try though. I love watching the equestrian events because you never otherwise get to see them on telly. Poor boyfriend decided to go play a computer game after I started explaining the finer points of dressage. I guess it does just look like a horse prancing about if you don't know what you are looking at. My brother in law has made us a few of Jamie's 30 minute meals. He reckons they should be called his 60 minute meals because that is how long they really take but they are very delicious and quite flash for what you could normally produce in that time. yummy snacks! I have to admit I am not watching much of the action - dh is though!